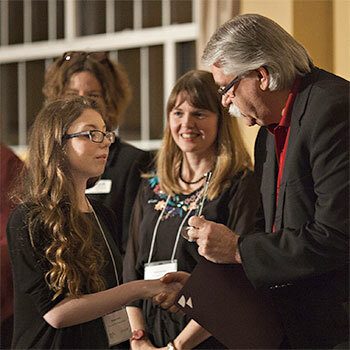 Brantford — A panel made up of academics, award-winning authors and the Speaker of the Ontario legislature selected The Lechton Wanderer by Abby Traina as the winner of the first-ever Laurier Stedman Prize. Results of this new writing competition were announced at a special ceremony on Friday evening. A student at Brantford Collegiate Institute and Vocational School, Traina receives a $3,000 cash prize, possibly the largest prize of its kind for a creative fiction competition open exclusively to high school students. The Laurier Stedman Prize is funded through an endowment and estate gift given to Wilfrid Laurier University by the late Miss Mary Stedman for the purpose of celebrating and promoting arts and culture. Stedman, who passed away in 2014, was a great champion of Laurier's Brantford campus, and during her lifetime served as an executive member of the Canadian Booksellers Association. The university created the Laurier Stedman Prize program, managed under the auspices of the English department in the Faculty of Liberal Arts, as a way to honour Stedman's wishes. Participants were asked to submit original, unpublished works of fiction, up to 1,500 words in length. The competition was open to students studying within the boundaries of Brantford's local school boards. It drew entries from nearly every secondary school in the Grand Erie and Brant Haldimand Norfolk Catholic District school boards, as well as Six Nations Polytechnic STEAM Academy, W. Ross Macdonald School, and Victoria Academy. All entries were submitted anonymously and vetted by a series of sub-juries. The top 10 were then passed on to a prize jury to rank the finalists, and ultimately select the winner. The prize jury was chaired by Kathryn Carter, Laurier's associate vice-president: teaching and learning, and also included: award-winning author Deborah Ellis, whose international bestseller The Breadwinner, is currently nominated for an Academy Award; Emily Urquhart, award-winning writer and folklorist and Laurier's current Edna Staebler Writer in Residence; the Hon. Dave Levac, MPP for Brant and Speaker of the Ontario legislature; and Heidi Northwood, dean of the Faculty of Liberal Arts at Laurier. Ellis was not able to attend the celebration in person, but sent greetings to the writers who took part in the Laurier Stedman Prize competition, stating: "It takes courage to put pen to paper, to expose your thoughts for all the world to see. You all have that courage, and you all have a love for storytelling, something that has been with our human species from the very beginning. I hope you all keep writing. Canada will be richer for the literature you produce." "Tonight was truly an historic occasion," said Brian Rosborough, Laurier's senior executive officer, Brantford campus and University External Relations. "It's incredibly gratifying to play a role in recognizing the rich talent among this generation of up-and-coming authors. We're so grateful to Mary Stedman for her foresight and generosity. The Laurier Stedman Prize is a program we look forward to continuing for many years to come." The grand prize-winning story and additional information on the Laurier Stedman Prize will be available at wlu.ca/LaurierStedmanPrize as of Monday, Feb. 5, 2018. Members of the Stedman family were active in the business, social and cultural fabric of Brantford and Brant County for more than a century. Mary Stedman's father, Samuel W. Stedman, went into business with his brothers in 1904, establishing the first Stedman's Bookstore on Colborne St. in Brantford. They went on to create a chain of five-and-10 cent department stores with locations across Canada. The Stedman name has become synonymous in Brantford with generosity and community building. Mary Stedman served as managing director of Stedman's Bookstore Ltd. from 1950 to 1974 and was a member of the executive of the Canadian Booksellers Association. She was also the director and former chair of the bursary committee of the Samuel W. Stedman Foundation. Mary Stedman was an early supporter of the idea of a university in Brantford, providing an important kick-start as one of the first donors to the fledgling campus in 1999. The university's bookstore bears the Stedman family name in recognition of their exceptional generosity. Gifts from Mary and the estate of her sister Ruth supported the construction of the university's Research and Academic Centre. Per Stedman's wishes, the Brantford campus bookstore is open not only to Laurier students, but to everyone in the community.